Hidden Deck Fasteners for Composite, Plastic and PVC Decking. Hidden deck fasteners made for composite, plastic and PVC decking. Why ruin the look of an expensive composite deck by using screws? Hidden fasteners are a better way to go. Unfortunately most hidden fasteners require special tools to install. Some of them will pentetrate the sides of the decking allowing water to seep in. Most must be purchased in boxes or buckets with unused material left over. Many so-called concealed fasteners are still visible in the end. Our unique deck fasteners offer you a better way. Aphano hidden deck fasteners install completely from above with no special tools required. There is no penetration of either the tops or the sides of the decking. Our fasteners are virtually invisible. With our fasteners you can purchase exactly what you need. If you do end up with anything extra simply return it for a full refund. We ship your order free right to your door. All of our products are backed by a 100% money back guarantee. If you are not satisfied send it back. We will even cover the return shipping. 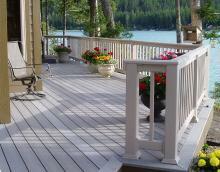 Low-maintenance decking can increase the value of your home. Whether you plan on hosting a party, entertaining a few friends or having a family barbecue a deck is a great addition to any home. Why not make it the best it can be? Although it may cost more initially, a composite deck can recoup 90% of its cost at resale and it can pay for itself in 4 years time. 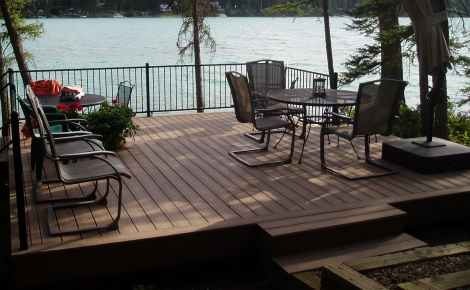 With low maintenance decking and Aphano hidden fasteners you will never have to worry about your deck again. You can order everything you need conveniently on-line. Visit our buy page where you can calculate the materials needed, determine the cost and place an order. If you need any help be sure to contact us using the contact form. Your satisfaction is guaranteed.